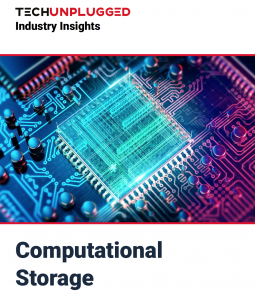 Computational Storage – TECHunplugged Industry Insights market research is now available! The last couple weeks have been hectic: the summer season is well over, the school year start is at full speed and it’s also the return of conferencing season! If you’re a blog regular, you may have seen my post during the weekend about The Rise of Computational Storage. At the end of this post I was announcing a spoiler about the first TECHunplugged market research paper to be soon published on that very same topic. Today, I’m thrilled to announce that our first market research paper is out! We decided to call these papers TECHunplugged Industry Insights, which combines both our TECHunplugged brand as well as the intent – which is, very originally, to provide the reader with insights on a given industry topic or emerging practice. Our very first paper covers Computational Storage. I warmly invite you to get your copy for free! Why all the talk about TECHunplugged? Am I not on kamshin.com? If you wonder why I am talking about TECHunplugged on this blog, the reason is simple: I am one of the two co-owners of TECHunplugged (my friend Arjan Timmerman is the other co-owner). TECHunplugged is the extension of our beginnings in the blogging and IT community world; it emphasizes our commitment to deliver quality and objective content to the community. But it is also our commitment as independent IT consultants to deliver outstanding work to our customers, whether they are vendors who make this industry, or organizations who consume the technology & solutions available on the market. While I strive to maintain kamshin.com as an independent blog with original content and no advertisement, I feel that readers should also get more awareness about the great things we’re doing with TECHunplugged. Our TECHunplugged Podcast (iTunes / Podcast site) is a great example: we bring together community figures and industry leaders to cover hot industry topics. This new Industry Insights series is another great example, and one we want to see thrive. It should be worth noting that this market research is independently performed by us and is not sponsored by any vendor. TECHunplugged is a commercial venture: even if we publish free content, we’re definitely open for business. Whether you work for a vendor and need help with messaging/influencer marketing, or whether you work for an organization which seeks consulting advice, TECHunplugged is here to help you. Contact us: we’ll get back to you, promised! But we also don’t want to forget our community roots. Expect to see more from us in the weeks / months to come!